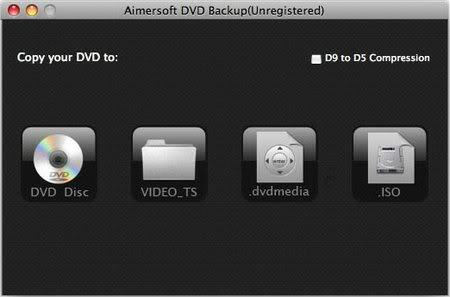 Aimersoft DVD Backup for Mac is professional DVD Backup software for Mac user that provides the best way to Backup DVD on Mac. With this powerful Mac DVD Backup software you can easily backup DVD on Mac OS X with high DVD Copy quality. * Perfectly compatible with Mac OS X, fully support Snow Leopard. * Backup DVD to a new DVD Disc on Mac. * Backup DVD to VIDEO_TS Folder, ISO Image or dvdmedia on Mac. * Support DVD /-R, DVD /-RW, DVD-RAM, Double/Dual Layer DVD. * Support External Driver and Hard Disk. * Three Different Copy Options to Backup DVD on Mac. * Add subtitles and sound track selecting function. * Easy Operation and User-Friendly Design.